Support DocumentationAssessor FAQHow do I make changes to a previously completed assessment? Making changes to previously completed assessments is referred to as a reassessment. Almost every type of assessment can be reassessed, excluding Self-Assessments. If the scores have already been released to the student, the changes that you make will automatically be reflected on their My Results screen. This lesson will walk you through the process of accessing the completed assessment to reassess. If you require additional instructions for actually changing criterion selections or comments, please refer to our full Re-Assess a Complete Assessment workflow. 3. 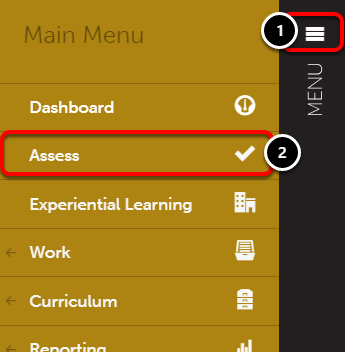 Click on the Completed Assessments button on the left side of the screen. 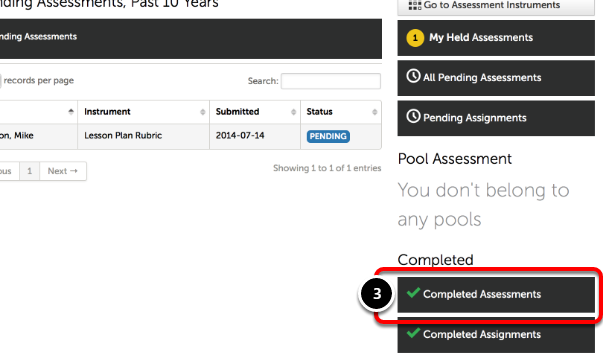 Locate the Completed Assessment that you would like to re-assess, and click anywhere on its row to reveal its options. Prev: How do I comment on student work? Next: Why does it say that my assessment is incomplete?